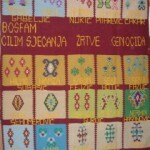 AP’s partner in Bosnia, the Bosnian family (BOSFAM), has produced fifteen memorial quilts that commemorate relatives of those who died in the 1995 massacre at Srebrenica. Altogether, the quilts carry the names of almost 350 victims, and represent an extraordinary intiative by their relatives to keep their memory alive. 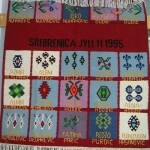 The Srebrenica memorial quilts have been widely shown in Bosnia, West Europe and North America as part of the larger campaign by Bosfam and AP, which is described elsewhere on this site. They have also provided a template for other community groups that might want to use weaving and quilting to tell their stories, and triggered AP’s program of advocacy quilting. 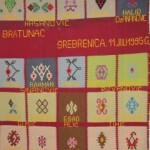 Well over 100,000 people had seen one or more of the Srebrenica quilts by the end of 2013. This page describes how the fifteen quilts were made, and lists events where they have been shown since 2007. It also places the exhibitions in the larger context of the campaign. At the bottom of the page, readers will find the names of benefactors who have sponsored panels. Neither BOSFAM nor AP have received funding for this program, but a hundred or so friends have sponsored a panel in memory of a relative, and given $40 to cover the cost of material. The page should be read in conjunction with other pages which profile AP’s partnership with BOSFAM, provide background on the Srebrenica massacre, and profile the BOSFAM weavers who worked on the quilts. The first memorial quilt was modeled on the AIDS Quilt, and woven in 2006 with assistance from Peace Fellow Yvette Barnes. Known as the Weavers’ Quilt, it carried the names of 20 massacre victims who had all been related to the weavers. The following year, AP took this quilt to St Louis on July 11, for the opening of a new mosque. Hundreds of former refugees who now live in the US attended the ceremony. Many were reduced to tears as they laid wreaths at the quilt. Back in Bosnia, meanwhile, the work went on. 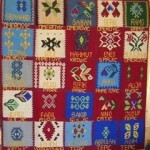 By 2008, the BOSFAM weavers had made three more memorial quilts, each with its own poignant story. 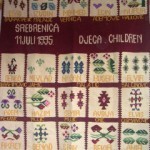 The Teachers Quilt remembered teachers who lost their lives at Srebrenica. Shweta Dewan, who served as the 2008 Peace Fellow at BOSFAM described the making of these four quilts in a blog. 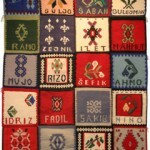 BOSFAM weavers continued working on quilts in 2009, and two of the quilts were shown at the trial of Radovan Karadzic in The Hague. Photos of the quilts appeared all around the world. By the summer of 2010, the weavers were finishing the series. The 14th Memorial Quilt remembered 20 children under the age of 16 and was woven in white to symbolize the innocence of the children, while the 15th Memorial Quilt commemorated 20 women who were killed because they decided to stay with their husbands and other male relatives. 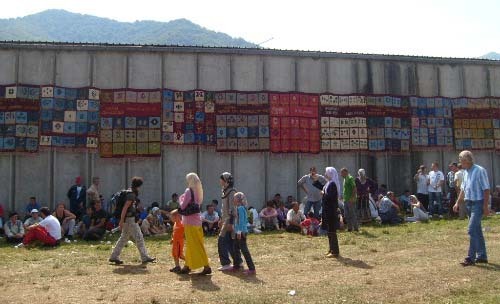 BOSFAM then took all fifteen quilts to the scene of the massacre, for the July 11 reburials that marked the fifteenth anniversary of the massacre. The quilts hung along the side of the notorious former Dutch UN base (below), while families reburied another 755 victims. 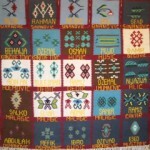 After July 11, 2010, BOSFAM stopped producing advocacy quilts, and the focus shifted to showing the quilts as widely as possible. In Bosnia, BOSFAM organized exhibits around the July 11 anniversary. Peace Fellows helped with the organization and produced videos. Outside Bosnia, in the US, AP showed the Srebrenica Memorial Quilt at a series of meetings and exhibitions, listed below. Two events in particular stand out. On March 8, 2012, AP and the UN Population Fund (UNFPA) teamed up to exhibit 13 advocacy quilts, from ten countries. The quilts included the diaspora quilt. Nine months later, on January 1, 2013, the quilt was again front and center at a new exhibit at Kean University, New Jersey. Ten years after the massacre, there is intense anger among survivors that neither of the two architects of the massacre – Ratko Mladic and Radovan Karadzic – are still free. BOSFAM and AP join with three other human rights NGOs to launch an online petition, calling for their arrest and prosecution and back the campaign in Bosnia with a speaking tour in the US for Beba Hadzic, BOSFAM’s Director, and Magbula Divovic, one of BOSFAM’s core members. The delegation meets with UN officials, US government, diplomats, NGOs, and artisans. They are received at the UN by Shashi Tharoor, UN Under-Secretary General in charge of communications. BOSFAM’s carpets play a key role in this mission. Beba shows carpets at the Bosnian embassy in Washington and meets with Aid to Artisans in Hartford to discuss a handicrafts project. The first Memorial Quilt at an AP reception in Washington. HE Claudia Fritsche, Ambassador for Liechtenstein, is on the left. BOSFAM and AP seek to upgrade BOSFAM’s weaving business and promote carpets as a source of income for the weavers. 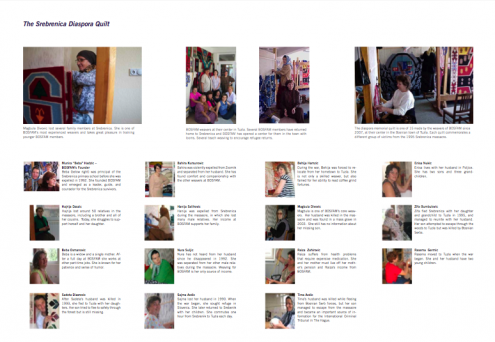 In Bosnia, Bosfam uses its website to market knitted goods online. In the US, AP uses the carpets to approach retailers and arranges for Overstock.com to sell a large consignment. This nets around $30,000 for the BOSFAM weavers. AP continues to promote the carpets at events in the US and encourage participation from civil society, particularly women’s groups. The Zonta Women’s Club of Washington purchases a BOSFAM carpet at their 2006 annual gala. 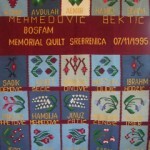 With AP’s encouragement, the BOSFAM weavers start work on the Srebrenica Memorial Quilt. The quilt commemorates relatives who died in 1995 and allows the weavers to use their weaving skills to advance their larger advocacy agenda and keep the memory of the massacre alive. They weave twenty panels which are connected into a quilt, shipped to the US, and unveiled at a reception for returning AP Peace Fellows, given by Ambassador Claudia Fritsche. 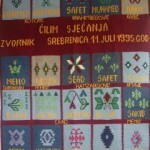 The first Srebrenica Memorial Quilt was displayed at St Louis on July 8, 2007 by Bosnians who survived the genocide and secured asylum in the US. 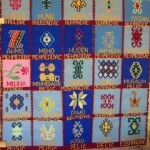 In July 2007 AP takes the Memorial Quilt to St Louis, which is home to some 30,000 former residents of Srebrenica. Most are refugees and thus highly sympathetic to BOSFAM’s message. The quilt is sponsored by the Association of Srebrenica Genocide Survivors and unveiled on July 11 – the 13th anniversary of the massacre – at the Islamic mosque in St Louis. The event is widely covered on radio and in the St Louis press. Several families in St Louis commission panels commemorating their own lost relatives, including the Sinanovic brothers, who lost their father and several other relatives in 1995. 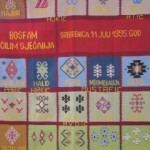 BOSFAM weavers produce four panels for the family, which are woven into a new quilt – the Srebrenica Diaspora Quilt. Peace Fellow Alison Morse from Tufts University – the seventh AP volunteer to work with BOSFAM – helps BOSFAM to scale up the project. 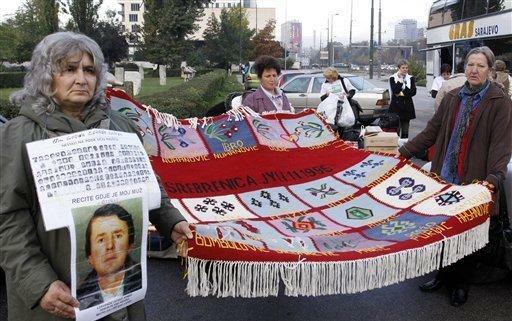 In Bosnia, work begins on a third quilt, commemorating teachers who were killed in 1995. Meanwhile, in Srebrenica itself, security improves, houses are vacated and repaired, and services are restored. This leads to an increase in refugee returns, and several more BOSFAM weavers return home. Washington, DC (July 10, 2008): The third memorial quilt is displayed at the Embassy of Bosnia and Herzegovina at an event commemorating the 13th anniversary of the massacre. Washington, DC (July 11, 2008): The third quilt is displayed by the Bosniak American Advisory Council for Bosnia and Herzegovina (BAACBH), a lobbying group for the Muslim diaspora, at an event on Capitol Hill. Serbia (July 22, 2008): Radovan Karadzic, head of the Bosnian Serbs during the war, is arrested in Belgrade, after the Serbian government yields to international pressure. New York City (July 12, 2008): The RACCOON women’s group (Reconciliation and Culture Cooperative Network) and AP display the Srebrenica Memorial Quilt for the first time in New York. Former AP Peace Fellow Alison Morse gives a presentation. 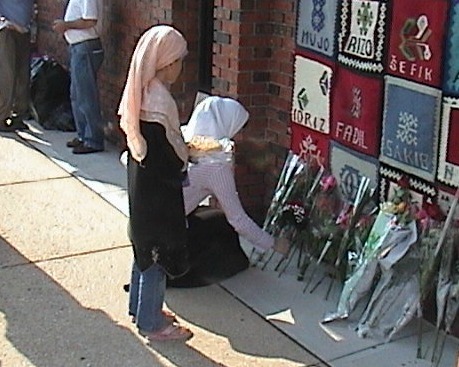 Former refugees from Srebrenica now living in the US placed flowers at the first Memorial Quilt, and wept openly, when the quilt went on display at the Bosnian mosque in St Louis on July 8, 2007. New York City (July 30, 2008): RACCON displays the Srebrenica Memorial Quilt at its monthly meeting. Hamilton, New York State (September 12-2008): Colgate University’s Center for Outreach, Volunteerism, and Education (COVE) displays the Srebrenica Memorial Quilt. Utica, New York State (September 12, 2008): AP Executive Director Iain Guest presents the Srebrenica Memorial Quilt to the Bosnian Islamic Association of Utica, New York. Washington, DC (September 18, 2008): Georgetown’s Human Rights Forum, the Institute for the Study of International Migration, and The Advocacy Project present a prize-winning film by the Bosnian director and writer Harun Mehmedinovic’s, In the Name of the Son. Mr Mehmedinovic survived the siege of Sarajevo and later immigrated to the US. The event also features the Quilt. Washington, DC (October 2, 2008): The International Finance Corporation (IFC) features the Quilt at its handicrafts store, the Pangea Artisan Market & Cafe during a presentation on Women Entrepreneurs of Bosnia and Herzegovina. Products from BOSFAM are sold during the event. Queens, New York (October 4, 2008): The Quilt is displayed at the RACCON Community Fair in Astoria Park in Queens, New York. BOSFAM products are sold and former AP Peace Fellow Janet Rabin discusses her work in Serbia with AP partner Women in Black. Making the Case Against Genocide: Mothers from Srebrenica carried memorial quilts to the Hague for the trial of Radovan Karadzic in 2008. This photo appeared in papers around the world. Utica, New York State (October 12, 2008): The Quilt is again displayed at the mosque of the Bosnian Islamic Association of Utica. Syracuse, New York (October 16, 2008): AP Outreach Coordinator Alison Sluiter presents the Srebrenica Memorial Quilt to the Islamic Cultural Center of Bosniaks of Syracuse. Hamilton, New York State (October 16, 2008): Colgate University student Daniela Koci organizes a showing of the Quilt to interested students. The quilt will be displayed in the university library for the next six months. Columbia University, New York City (November 11, 2008): The Quilt is displayed at a panel discussion sponsored by: The Center for the Study of Human Rights; the Humanitarian Affairs Working Group; the Human Rights Working Group; and Rightslink. Former AP Peace Fellow Shweta Dewan (A Columbia alumna) and AP’s Outreach Coordinator Alison Sluiter participate. Washington DC (November 30, 2008): AP Outreach Coordinator Alison Sluiter participates in a panel discussion at Theater Jon Bosnia. AP uses the event to fundraise for BOSFAM through ticket sales and the sale of BOSFAM products at the performance. The Quilt is displayed. 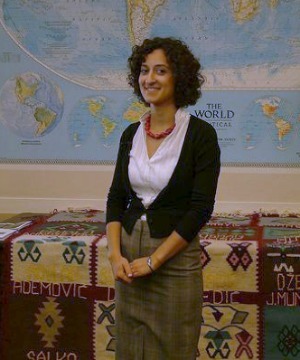 The first Srebrenica Memorial Quilt was shown at the US Capitol several times between 2008 and 2011, thanks to the efforts of Elmina Kulasic, head of the Bosnian diaspora lobbying group BAACBH. Elmina was 8 years old when the war broke out in Bosnia. Her family was rounded up and imprisoned in the Trnoplje concentration camp. After their release, they were granted refugee status in the US. Elmina was an articulate spokesperson for a unified, multiethnic Bosnia in Washington and an enthusiastic advocate of the Quilt project before she returned to Bosnia. 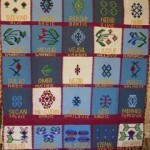 By early 2009, the Bosfam weavers have produced four memorial quilts. In the US, the Quilt project has attracted enthusiastic support from Elmina Kulasic, the Director of the Washington-based BAACBH, which represents the Bosnian community in the US. Elmina, herself a survivor of a concentration camp during the war, understands the appeal of the quilt as a symbol of resistance by massacre survivors and helps AP secure funding from the Boell Foundation for another promotional trip by Beba Hadzic to the US in 2009. Beba arrives in March. Over the next month she, Elmina and Alison Sluiter, AP’s Outreach Coordinator work as a team and meet with hundreds of Bosniaks in St Louis, Washington, New York and Chicago. St. Louis (March 8, 2009): BOSFAM Director Beba Hadzic meets with members of the Association of Srebrenica Genocide Survivors – St. Louis. The group is presented with the fourth quilt made by Bosfam weavers, which carries panels that were sponsored by the diaspora in St. Louis. The group pledges to sponsor seven new panels for a new Quilt. The team will meet with eight different associations (St. Louis Congress of North American Bosniaks, the Association of Srebrenica Genocide Survivors, the Association of Concentration Camp Survivors USA – St. Louis, the Islamic Community of St. Louis, the St. Louis Youth Circle, Sevdah St. Louis, and the Djerdan Folk Dance Group). St. Louis (March 8, 2009): Beba Hadzic, Elmina Kulasic and Alison Sluiter are interviewed for the Bosnian diaspora TV station Bostel. The televised appearance is arranged by Murat Muratovic, BAACBH Board member and head of the Bosnia Media Group. Chicago (March 9, 2009): The quilt travels to Chicago, where it is shown to the BAACBH Board of Trustees Members and Enes Karic, President of the Srebrenica Association of Chicago; to the Sultzer Public Library; and to the Bosnian American Cultural Association. Washington, DC (March 10, 2009): Beba Hadzic, Elmina Kulasic, AP Executive Director Iain Guest, and Sebastian Gräfe from The Heinrich Böll Foundation, join the Former Bosnian Ambassador to the United States, Dr. Bisera Turkovic, to speak at the US Capitol on the occasion of Bosnian Women’s Day. The event is sponsored by Congresswoman Eddie Bernice Johnson (D-Texas). Two of the Quilts are shown and Congresswoman Johnson expresses her appreciation for the project and its contribution to women’s peace-building in BiH. Washington, DC (March 11, 2009): Beba Hadzic, Elmina Kulasic and members of the AP staff met with Sebastian Gräfe and Liane Shalatek of the Heinrich Böll Foundation to express their thanks for supporting the Quilt project in the US. New York Astoria (March 19, 2009): Beba Hadzic, Elmina Kulasic, and Alison Sluiter, join Stephanie Grepo from the Institute for the Study of Human Rights at Columbia University to display the Quilt at the BiH Islamic Center of New York. The community donates $800. This will enable BOSFAM to weave an entire memorial quilt. New York City (March 19, 2009): AP, BAACBH, The Columbia University Center for the Study of Human Rights, and Lidia Bastianich co-sponsor a fundraising lunch for Beba Hadzic at Ms Bastianich’s Manhattan restaurant, Felidia. Ms Bastianich congratulates Beba Hadzic for her efforts to promote truth and justice in BiH (photo). 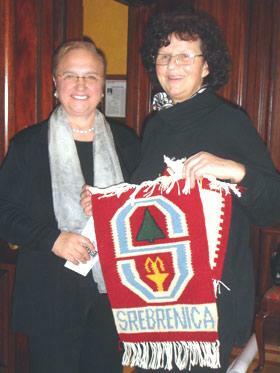 Lidia Bastianich, left, a well-known New York Chef welcomed Beba Hadzic at her restaurant during Beba’s trip to the US in 2009. New York City (March 19, 2009): Beba Hadzic, BAACBH Elmina Kulasic, and Alison Sluiter met with Ivan Barbalic, the BiH Permanent Mission to the United Nations. Mr Barbalic expresses his support for BOSFAM and its campaign to bring justice to the victims and survivors of genocide in Srebrenica. New York City (March 13, 2009): Beba Hadzic, Elmina Kulasic, and Alison Sluiter speak at an event on Srebrenica at Columbia University, sponsored by the Harriman Institute. Former AP Peace Fellow Shweta Dewan, a Columbia University grad student, also participates. Washington, DC (July, 14 2009): AP hosts a special exhibit, “Remembering Srebrenica”, to commemorate the 14th anniversary of the genocide. The event features the Srebrenica Quilt, the Guatemala Quilt, several large Bosfam carpets and other knitted products from the Bosfam store. Three days later, on July 17, AP staff host a special showing of the exhibition for staff from the Bosnian Embassy. Damir Dzanko, Deputy Chief of Mission, speaks moving of Bosnia and thanks AP and Bosfam for their work on behalf of peace in his country. The event also features video footage from AP Fellows in Bosnia and Serbia, where two Fellows are volunteering with the Serbian Women in Black. Women in Black organize a public protest in Belgrade against nationalism, and attract taunts and intimidation from skinheads. AP shows video of this event and shows photos and videos from Donna, Alison and Kelsey – 2009 Peace Fellows who attended the recent burial ceremony at Potocari, Srebrenica, on July 11. AP Volunteers and staff have attended all of the reburials and ceremonies since they started in 2003. The Hague (October 26, 2009): Radovan Karadzic goes on trial at the International Criminal tribunal in The Hague. The Mothers of Srebrenica, a high-profile advocacy group, take two of the Bosnia quilts to the Hague for the opening of the trial. The photo appears in the media all over the world, helping to draw attention to the needs of survivors. The Quilts are helping Bosfam to achieve another of their objectives – securing justice. Bosfam and AP intensify their efforts in preparation for the fifteenth anniversary of the massacre, which is expected to attract a huge number of sympathizers from around the world. 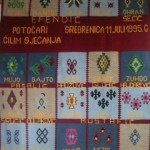 In Bosnia, Bosfam completes the last of 15 quilts. AP Board member Soren Jessen-Petersen, who served as the UNHCR representative in Bosnia (1996) donates $500 to cover the cost of wool and dye. Washington DC (January 2010): Alison Sluiter, who is now volunteering full-time at Bosfam, arranges for Bosfam’s knitted products to be sold through the crafts store at the Holocaust Museum in Washington DC. Seattle, Washington state (March-May, 2010): Peter Lippman and Julia Hurd organize a series of showings for the Diaspora Quilt on the West Coast of the US – one of the few regions where the Quilt has not been shown. The events include an exhibition of the Quilt and photos from Bosnia at a library in Burien in cooperation with the local branch of the Congress of North American Bosniaks. The Quilt is also used at the inauguration of a new Bosnian mosque in Shoreline (below). 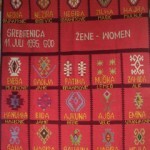 Peter uses the Quilt to illustrate his talk about life, death and recovery in Srebrenica. Potcari, Bosnia (July 11, 2010): Peace Fellow Laila Zulkaphil helps BOSFAM to show all 15 quilts on Battery Factory in Srebrenica. 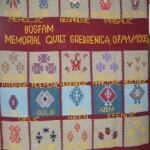 In Tribute: BOSFAM arranged for all fifteen memorial quilts to be displayed at the site of the Srebrenica massacre on July 11, 2010 – the 15th anniversary of the killing. 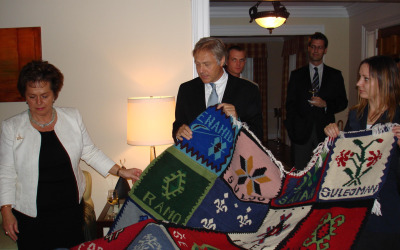 Alison the Compassionate: No-one from AP worked harder for BOSFAM, and the quilt project, than Alison Sluiter, seen here at the house of Magbula Divovic (left) a massacre survivor and expert quilter. Alison accompanied Beba Hadzic (center) on a visit to the Bosnia diaspora in the US, and worked as a Peace Fellow at BOSFAM in 2009. She married a Bosnian and now lives in Sarajevo. Srebrenica, Bosnia (July 2011): BOSFAM weavers who have returned home meet each day at the new BOSFAM center in Srebrenica to weave and train younger returning refugees (below). Tuzla, Bosnia (July 5-13, 2011): Helped by Peace Fellows Quinn and Julia, BOSFAM organizes an exhibition of 14 quilts in Tuzla to commemorate the 16th anniversary of the massacre. Hartford Connecticut (November 3, 2011): The Srebrenica diaspora quilt headlines at Rugs of Remembrance, an exhibit of Bosnian diaspora weaving at the Institute for Community Research, Hartford Connecticut. Members of the Bosnian diaspora, now living in Hartford, participate and demonstrate how to weave (below). The United Nations, (New York March 8, 2012): The Srebrenica Diaspora Quilt is one of thirteen advocacy quilts exhibited by AP in the atrium of the UN building. The exhibition draws an estimated 80,000 visitors. Long Island, New York (September 2012): The Holocaust Memorial & Tolerance Centerexhibits the Gracanica Roma Quilt, and the BOSFAM Srebrenica Diaspora Quilt at an event on genocide. Union, New Jersey (January–September 2013): The Diaspora Quilt is displayed, along with 23 other advocacy quilts, at Kean university, where it was used by professors to illustrate themes of war, peace and genocide. Click on the images below to bring up profiles of those who are commemorated, and photos where they are available.